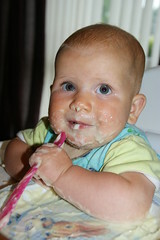 Anna and Amaia's blog: I'm sure I can feed myself mash! Daddy thinks I am old enough now to feed myself. Yesterday he gave me a plate of mash and a spoon. I definitely managed to get some of it into my mouth with a spoon but it's not as easy as these adults and bigger kids make it look... mind you I am only five months old! And it's annoying the way it gets all over your elbows!